Do you want a steamer that has nice volume, good pressure and heat, recovers well, reliable, and affordable? Did you think all these things together did not exist? Look no further. NOW at 85 PSI- see our videos here on how and why we can increase pressure. Its not a huge jump but it will help. Introducing the Chief Steamer Single PRO 75. This professional and commercial single boiler steam cleaner is a true commercial grade. We wanted it to have great pressure and heat, have a commercial stainless steel body, and ALL commercial components. This was not an easy task. But we have done it. Take a look at the body. Its not a plastic body. We do not like plastic bodies. Its all heavy gauge stainless steel and can take a beating! We used a heavy duty AISI 304 stainless steel boiler and gave it a lifetime warranty. It meets all the standards. 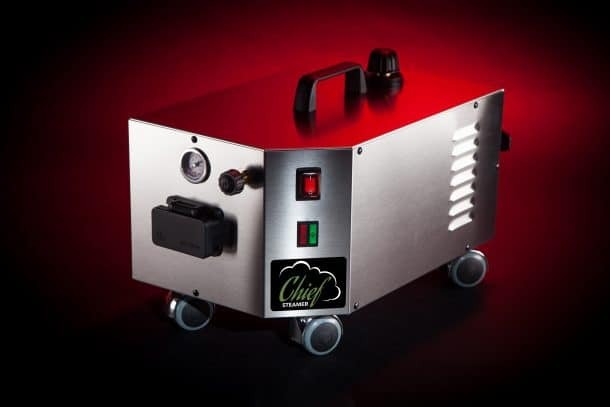 The Chief Steamer Single PRO 75 also has an "EXTERNAL" heating element. Yes, the heater is outside the boiler!! How does this work and why? Well, most steam cleaners have an internal "coiled" heater which sits in the water inside the boiler. After time and non-maintenance, the coils may become corroded and calcified. This leads to slow heating and recovery time, as well as possible failure. What we have done is to mount the heater on the underside of the boiler. With this configuration, there is little heat lost and the heater is not immersed in water! Heat is quickly transmitted and radiated through the stainless steel boiler and the water heats just as fast. With this design, the heater can be warranted for LIFE! This is just another great feature of the Chief Steamer Single PRO 75 steam cleaner. We also have fabulous steam delivery and volume compared to some of the others. Our pressure rating is already higher, but you will not notice a huge pressure drop while using it, and the amount of steam you get out of the nozzle is excellent! NOW at 85 PSI. A modest 10 PSI increase but it will help with "working" pressure. Attention Detailers- We want to let you know that we can pack a machine used for detailing with what we call the "detailers kit". This means that we are subtracting a few items that detailers do not use on a car. In all our years in detailing cars and using steam cleaners, we have found these attachments to not be needed. So, what we are doing is offering a $35 credit if you choose to leave these out. Please look at our video explaining this here. Why buy a cheaper steam cleaner to perform tough cleaning tasks? Why buy something that is NOT made in Italy? Compare ours to anything else that is out there and decide for yourself. This machine is made to perform and last. What an impressive tool! I just got it last night, and I'm already in love with it. The pressure is amazing and the build quality seems second to none! I have no doubt that this steamer will last for years. All of the nozzles and heads fit great and don't seem to get loose. I have only used this model for two days now cleaning mainly my bathrooms and I am very impressed with it. I bought my unit on a Monday and it arrived at my door on a Wednesday. Great shipping time. It was very well packaged. I did research on other brands similar to this model and I eventually thought they were charging too much. The instructions were easy to follow on the do's and don'ts of the unit. Sure it takes 10-12 minutes to get up to pressure, but it is worth the wait when you see what it clean. I did make the mistake of using the nylon brush on grout which made me do more passes back and forth and wore down the brush a bit. When I switched to the copper brush it work much better and faster. Tried the squeege to clean the windows and mirrors. No streaking which was nice. I also used the tip just to let hot steam out and I sanitized the whole toilet. The horse hair brushes were nice and soft and cleaned out the calcium around my faucets without scratching them. The rest of the components look well built and I have yet to use them all so far.III know I will be using this machine to clean other items and I am sure it is up to the task. I would recommend Vapor Chief steamers to anyone. The Vapor Chief “Single” Commercial 75 is our very first steamer. We bought one mainly to help clean walls and ceilings with 16 years of Cigarette smoke and whatever else was mixed with it so we could repaint (The whole house). The flat ceiling paint looked like satin with all of the nicotine. I bought some rectangle tool bonnets from a competitor. My hopes were really high. The steamer came well packed and in perfect shape. I could not get 2 Liters of water in. It was closer to 1.5. It filled up to then top and I had to dump some per the instructions.. I used distilled even though Kevin’s video says tap water is fine. For .75 a gallon I figured why not. It did take about 12 minutes to build to 75 PSI. At about 1/2 pressure with one extension and the rectangle tool with a bonnet on it, with my bad shoulder and my wife watching thinking about the cost, I made my first pass after running some steam through the bonnet. From the top to middle of the wall with the steam on, Instant gratification! Both of us at the same time…Wow! I had done a 21 foot wall and part of the ceiling in about an hour. Not perfect, but WOW! The bonnets did load up quickly due to all of the nicotine on the walls and the ceiling. I used 4 out of 5 for that first wall and part of the ceiling. I ended up using TSP-PF and clean water with a sponge with a microfiber cloth on one side for the ceiling for finishing. It looked so good I did the walls also. This steamer truly made it easier by removing the bulk the of gunk with little effort. The manual cleaning after the steaming was low effort. More like a quick wipe down. I’m not going to say it was fun, (Walls and Ceiling), but if we weren’t painting new colors, I would just leave it. Not much more I can say. I used it for about 2 hours with short breaks (many) and the water level light never can on. Day 2, I was able to get 1.5 liters in without it over filling making me think there was water in it out of the box? There was a bit of pressure in it out of the box. I think that will be my normal fill amount from now on. 1.5 liters. The recovery time on this machine is crazy. After pushing it with full pressure to see how far I could get, the thunk sound came on when pushing the button. I put down the tool, walked into the kitchen, grabbed some water from the fridge, walked back into the living room 5 feet away, looked down and about 10 seconds later I was pointing at the GREEN light and the pressure which was at 75. That impressed me more than my wife, but over and over recovery was impressive. We tried the single hole tool with a horse hair brush on my wife’s dusty nick backs and porcelain roses with a lot of creases with very low pressure (About a quarter turn from zero.) 15 seconds later they looked new. Our fridge (White) with the dirty handles. I gave up on trying to clean them a long time ago. Same tool and brush with my wife watching. 10-15 seconds and they looked like new. My wife FINALLY said, “You did good”! I tried the squeegee tool on a big dust and nicotine covered mirror. NO GO. It just streaked into a giant mess. I had to break out the glass cleaner to clean it up. Maybe if I spent more time on it, but the glass cleaner worked instantly. I will finish with this. I did a TON of research. I wanted Great at a Great price. I actually came across this steamer by chance. I am lucky that I did. I think I did Great. My one suggestion to Kevin is to get together with more vendors and offer rectangular bonnets and a Steam Mop attachment. Other than that, I am sure that I made the right decision for our needs. I will be steaming EVERYTHING. Ladies, it’s a guy thing. I did the living room clock and my wife looked at me and just smiled! I am a Vapor Chief fan! I bought it to clean my house and my car which my husband does. It is amazing on my oven and refrigerator. It cleans grout and tile with ease. Sinks and faucets are no problem. I cleaned the range hood easily. It just hangs in there. I hesitated to pay this much money for a commercial machine when I really did not need a commercial rating. But many residential models are about this price. Handle does get a little hot after using for a while. Purchased this for car interiors to aid in my mobile detailing side job. It works wonderfully! You cant beat the price for the specs of this machine. If you're a busy car detailer or plan to do entire house carpets, consider the 100 model for its continuous fill feature and of course the extra PSI cleaning power! You have successfully subscribed. Don't for get to act quick and use code SP10 during checkout.